Tanja Maljartschuk was born in 1983 in Ivano-Frankivsk, Ukraine, and studied philosophy at Vasyl Stefanyk University. 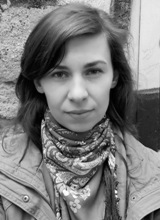 She subsequently moved to Kiev, where she worked as a journalist for the TV channel Kanal 5, among others. In 2004 she published her first prose volume, with a title that roughly translates as »Adolfo’s Final Match or Roses for Liza«, followed by four volumes of short stories. 2009 saw the publication of »Neunprozentiger Haushaltsessig« (tr: Ninety percent vinegar essence), a volume of the author’s short stories translated into German. Three different worlds are presented in three parts: the world of the present »I«, the archaic world of a village from an indeterminate time, and the world of a Ukrainian child just at the end of the Cold War. Maljartschuk’s characters are failed figures who seem from the outside to act in a rather absurd or crazy manner, but manage to create for themselves an inner freedom while the old and new worlds surrounding them collide. In a review, the author Petra van Cronenburg discussed Maljartschuk’s narrative style as such: »Initially the book seemed almost rough, deeply melancholic and drenched in emotion. But this impression is quickly dispelled if the reader engages with the soft tones that lead to a tiny, momentary shift of atmosphere to much larger effect.« In 2012 Maljartschuk published her first novel, titled »Biohrafija vypadkovoho čuda« (tr: Biography of a chance miracle), which tells the story of Lena, who grows up in a world of arbitrariness and violence. However, Lena is able to defend herself with humor, stubbornness and a healthy dose of courage as she searches for the »chance miracle« – a flying woman who always appears where help is needed most. Lena helps people and animals in danger of being crushed by the country’s transformation into a market-based democracy. The »Frankfurter Allgemeine Zeitung« called the novel a work of sublime sadness as well as wonderfully bitter piece of literature in the style of Mikhail Yevgrafovich Saltykov-Shchedrin, a satirist from the Russian school of critical realism. Most recently she published a volume of nine stories in German titled »Von Hasen und anderen Europäern: Geschichten aus Kiew« (2014; tr: On rabbits and other Europeans: Stories from Kiev), in which various forms of Homo sovieticus are classified by means of animals and their characteristic attributes. In 2013, »Belletrista«, the online magazine for international literature by women, described Maljartschuk as a modern-day magical realist version of the Russian author Anton Chekhov. The same year she was awarded the Kristall Vilenica Prize at the Vilenica International Literature Festival in Slovenia and the Joseph Conrad Preis. In 2015 she received a fellowship from the Akademie der Künste in Berlin. Maljartschuk’s work has been translated into eight languages. She currently lives in Vienna.